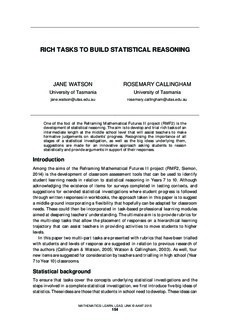 One of the foci of the Reframing Mathematical Futures II project (RMF2) is the development of statistical reasoning. The aim is to develop and trial rich tasks of an intermediate length at the middle school level that will assist teachers to make formative judgements on students’ progress. Recognising the importance of all stages of a statistical investigation, as well as the big ideas underlying them, suggestions are made for an innovative approach asking students to reason statistically and provide arguments in support of their responses.